So last year when I was trying to comb through all of the year end Album of the Year (AOTY) lists I found the process a bit tedious. I had to jump from list to list trying to remember how each album ranked. Unfortunately, some lists weren't widely available or they didn't link directly to music. My solution for YE 2012 was to create a dashboard (less about art and more about function) intended to help you to discover albums from 2012 using a combination of average review scores, top review lists, and sales data. Having everything in one screen lets you click on albums you might want to listen to and do your own discovery from there. My suggestion is to pick a genre or a top ten list as a filter, then hover over the albums and use the links to listen for yourself. Visualization was done in Tableau 7 and Tableau 8(currently in beta). All data was retrieved within December. Please see the links at the bottom for all sources. Couldn't end the post without a song! Heres a great mashup of 50+ big songs from the year.. Here is a demo of the Tableau 8 wordcloud capabilities. 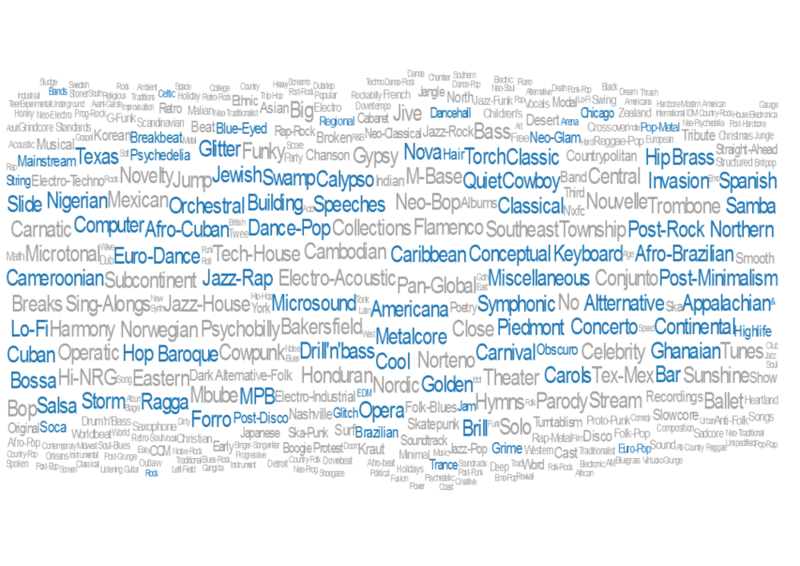 Blue words indicate genre tags that were not used in 2011. Larger size indicates it was more rarely used.